God created all types of angels, composed of spirit essence, simply by willing them into existence (Psalm 148:2, 5, see also Colossians 1:16). The Bible seems to indicate that these beings were made in order to fill different responsibilities and tasks that had already been determined (Ezekiel 28:13 - 15, Colossians 1:16). Angels were made by him before the creation of the physical universe and were all, at least initially, obedient to him (Job 38:7). The Bible does not state how many angels God created or how many total types of these spirits were brought into existence. We only that, to man, they seem innumerable (Hebrews 12:22). The prophet Daniel describes a dream (vision?) he had where he was given an awesome view not only of the Eternal's throne but also of the countless righteous spirits who served him (Daniel 7:10). Taken literally, he records viewing one hundred million angels in heaven, but this large number may merely represent a group far bigger than could be counted. There are two very broad categories of angels. The first are those who followed Lucifer's lead and, because of their rebellion against the Eternal, became demons. The Bible strongly implies that one-third of all the spirits rebelled against their Creator (Revelation 12:4). The second are those who stayed loyal to God (righteous). Scripture also describes at least four special divisions of spirit-composed angels. They are archangels, the cherubim, the seraphim, and the four living creatures. The total number of beings in the four categories likely only represent a small fraction of all obedient spirits in existence. Why do spirit beings exist? The Bible records the names of only two angels that we would consider Archangels. Their names are Michael and Gabriel. Michael is specifically named as an Archangel in Jude 9. 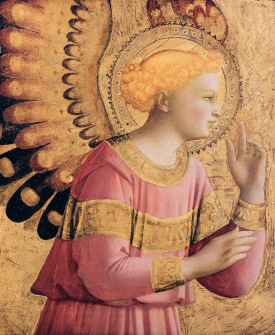 Although Gabriel is not directly referred to as in this class of beings, his involvement in major Bible events (announcing the births of Jesus and John the Baptist, directing Joseph on what to do, etc.) arguably puts him in this category. The privilege of heralding the resurrection of all the dead saints will be given to an archangel (1Thessalonians 4:16). Cherubim have played an interesting role throughout Biblical history. They are the first class of angels mentioning in Scripture, as they were the ones to protect the tree of life after man sinned in Eden (Genesis 3:24). It was a Cherub named Lucifer who brought sin into the universe (Ezekiel 28:14 - 15). The Ark of the Covenant was built with the wings of two Cherubs stretched over it (Exodus 25:20, 22, 37:7 - 9). A picture of these cherubim was also woven into the blue, purple and scarlet curtains used in Israel's wilderness tabernacle (Exodus 26:1, 31, 36:8, 35). Ezekiel's great "wheel in the middle of a wheel" visions, in which he was shown God's throne room, had four cherubim in it. Each of the angels had four faces. They were the face of a man, lion, ox and eagle (Ezekiel 1, 10). Seraphim, which means "burning or fiery" (Strong's Concordance #H8314), are only mentioned in the book of Isaiah the prophet (Isaiah 6:1 - 3). Other than what is revealed in Isaiah, that these angels were created to praise God and to act as a means of communication between the Lord and humans, not much else is known. The last of the four types of angels covered in this article are referred to as the "four living creatures." They are only mentioned in the book of Revelation (Revelation 4:6). Their fulltime job is to praise God and his eternal glory continually (verse 8). The devil's great war against God! Do spirit beings fight battles?